Copyright © 2010-2019 The York House. Please take a moment to provide the following information. We will get back to you shortly. ...In St. Louis, the latest development to tap the high-end market is York House, scheduled to open in September at 4931 Lindell Boulevard. Completed in 1922 as the Chase Apartments, the building's $12 million renovation will provide just 33 apartments on eight floors. The vacant Chase Apartments building in the Central West End, once home to both residents and the KPLR-TV 11 offices, is being transformed into luxury apartment units. Koplar and Gast are renovating the 20 existing apartment units into 32 luxury apartments as well as a private penthouse unit. In 2008, a collaboration formed with the goal of providing a unique experience for today's urban resident. Sam Koplar and Ted Gast believe that when you combine first-class apartments with a superior location, you have the perfect place to call home. Which is why they are committed to developing the 1920's building on Lindell Blvd in the Central West End into St. Louis' premiere apartment residences, serving up innovative design and attentive service. Both are acutely aware of the building's location, it's history, and it's potential, as their unique backgrounds merge to re-engineer this iconic building for the next century. For Ted, a native St. Louisan, the York House is his first development project in St. Louis. He has been constructing and developing residential projects in California since 2001, including the Barker Brothers Lofts in Los Angeles, California, and The Glassworks Residence in San Francisco, California. The Barker Brothers Lofts is a 297-unit condominium development in downtown Los Angeles, involving the renovation of four existing warehouse buildings, and the construction of two new parking garages. Ted managed the financing and development of the $180MM project while at The Kor Group, a developer of high-end hotel and residential properties. For "The Glassworks," a mixed-use development including high-end condominiums, office space, and ground floor restaurant/retail space, Ted helped manage the construction along with his team at McCarthy Building Companies. He enjoyed transforming an empty parking lot across the street from AT&T ballpark into a modern masterpiece, and a catalyst for the Mission Bay development district of downtown San Francisco. 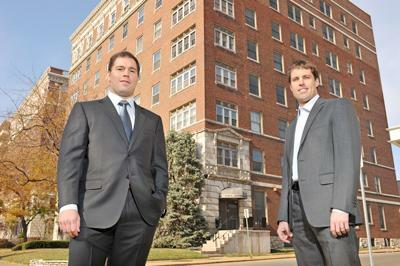 Sam represents the 4th generation of the Koplar family to be developing real estate in the city of St. Louis. The York House is Sam's follow up project to Maryland Plaza, a redevelopment of what was an iconic shopping district that had spent years in decay. Koplar Properties envisioned a completely new streetscape to attract modern retail, and Maryland Plaza today is St. Louis's favorite destination for high-end boutique retail, exciting nightlife, world class dining, and dynamic office space. The York House will continue Sam's great grandfather's vision of marrying the highest standards of construction quality with warm hospitality to surpass the expectations of each and every resident and guest. The York House building was completed in 1922, and originally named the Chase Apartments after its creator, Chase Ullman. Its architectural design combines elements of Neoclassical Revival with a muted Beaux Arts Style consistent with the historic character of the Central West End. It was created in an era of sophisticated urban living, and this block was at the center of it all. "Meet me in St. Louis" was filmed along Lindell Boulevard. The Chase Club next-door was the place to see celebrity performers including Frank Sinatra, Dean Martin, Sammie Davis Jr., Jerry Lewis and Bob Hope. These events were broadcast locally and nationally, and this block became a mainstay for entertainment in St. Louis. Later in the century, KPLR Channel 11 was headquartered in the building, and filming took place in the adjacent studio. During the flood of 1993, Peter Jennings broadcasted the ABC national news from the 4th floor of the York House. Due to the York House's unique past, Sam and Ted feel it is important to preserve this building's spirit and sense of place. While they hope the future residents will imagine the York House as the stage for their modern lifestyle, they also hope they wonder, "What was this place?"